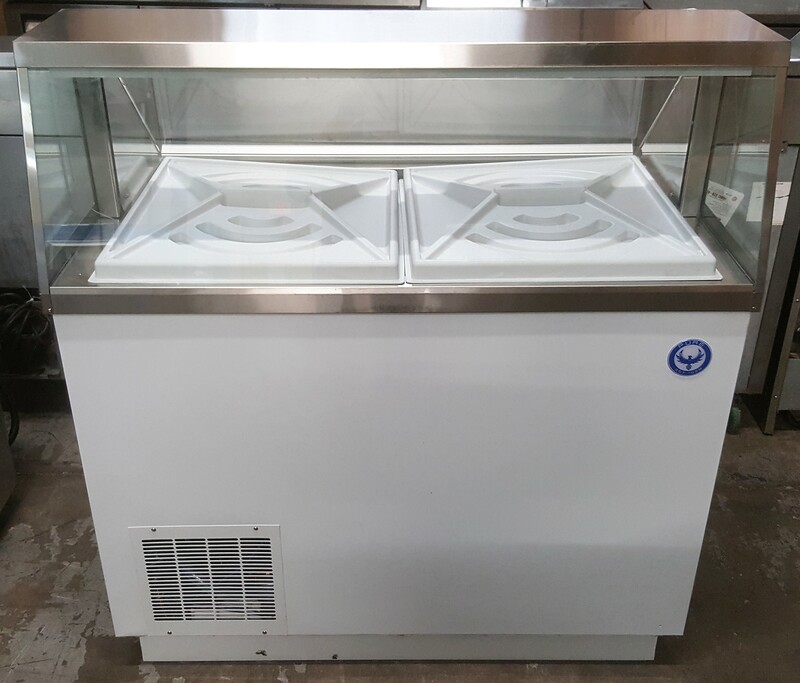 New 8 Bin Ice Cream Dipping Cabinet by PURE Manufacturing of Phoenix Arizona, In Stock NOW! Creating a mouthwatering presentation and quick serving quality ice cream has never been easier than with the PURE 47″ ice cream freezer dipping cabinet! The attractive and durable white finish and LED lighting create an eye-catching focal point in your establishment. The angle glass front creates greater visibility and even allows children to pick out their flavors easily. The Eco-Friendly and Energy Efficient Hydro-Carbon Compressor create an array of energy saving features make this cabinet a great choice for ice cream shops, gelato shops, restaurants and more! 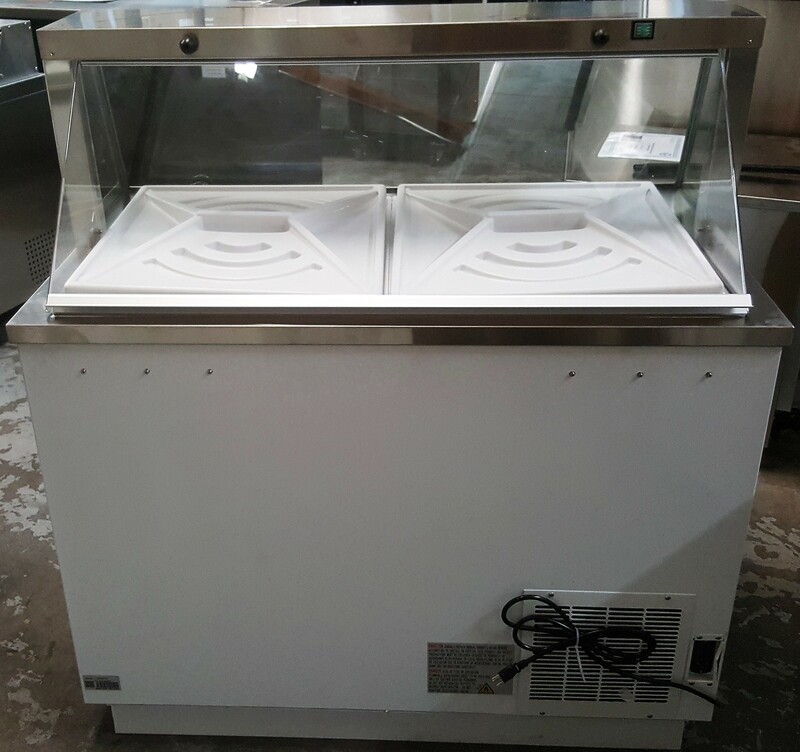 This large capacity ice cream dipping cabinet can hold twelve (12) 3-gallon cans of ice cream. That’s 8 3 gallon cans on display with 4 below in storage. Each rack comes with an ABS plastic can holders to keep the gallons in place for more efficient scooping. Equipped with a Hydro-Carbon R290 compressor, the compressor of choice for McDonald’s, Starbucks, and Redbull. Plus, it comes with 2 night covers to conserve energy overnight. The brighter LED bulbs actually generate less heat in the cabinet, which reduces power consumption. The condenser is coated and designed to prevent tarnishing and requires less cleaning. This will save you money on maintenance costs. Bright white painted steel interior and exterior. temperature set point and defrost frequency. between -10℉ and 5℉ (-23℃ to -15℃). condenser coil for cleaning and service. 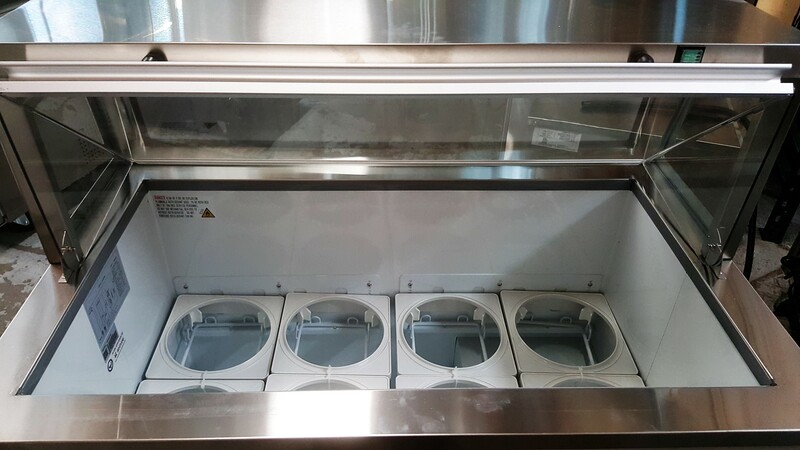 Be the first to review “DPC46-HC 47″ 8 Bin Ice Cream Dipping Cabinet” Click here to cancel reply.